NEW YORK — In a monumental effort to recreate and produce the 1950s blockbuster "Ben-Hur" for modern audiences, Hollywood power couple Roma Downey and Mark Burnett took a page from Mel Gibson's playbook. The duo shot a remake of the classic film in Matera, Italy — one of the same locations that Gibson used in his 2004 megahit "The Passion of the Christ." Downey, who screened clips of the film at a private event at the Sheen Center in New York City on Oct. 9, explained why they chose the location to bring their version of first century Jerusalem to life. "Matera is absolutely gorgeous. It's where Mel Gibson filmed 'The Passion of the Christ.' It's a beautiful, interesting-looking town that's carved out of rock and had all these caves and was able to provide for us on the film a geography and landscape of rocky terrain, because, of course, we couldn't shoot in Jerusalem," said Downey. 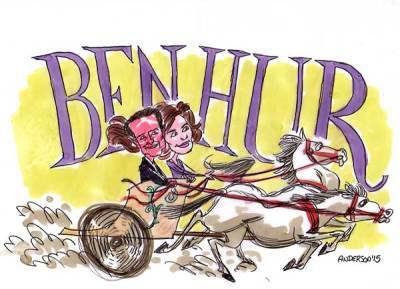 Roma Downey and Mark Burnett Take On "Ben Hur"
"It gave us our Jerusalem exteriors and absolutely beautiful winding streets and hillsides. They had the texture, roughness and feel of what we were looking [for] that portion of the movie," she added. The "Ben-Hur" remake stars "American Hustle's" Jack Huston as Judah Ben-Hur, the Palestinian Jewish protagonist who battles the Roman Empire at the time of Christ, and features appearances by Jesus, who is played by Rodrigo Santoro. Morgan Freeman also stars in the film as Ilderim. The complex tale, originally delivered with Charlton Heston as the front man and William Wyler as director in 1959, has had a great impact on those who have seen it over the years, but Downey thinks a reimagining is in order because many teenagers and young adults have never even heard of it. "It was very terrifying for us to tackle [a movie] that is engraved not just in the minds and memories of people, but in their hearts. The 1959 version is one of those films that people remember who they watched it with or the feelings that it evoked. But 1959 is a long time ago and when Mark and I told our kids we were working on [the remake] my kids, who range in age from 18 to 22, said 'Ben-Who?'" said Downey. "It's a great story and it needs to be told again. And if you thought the [original] chariot race was amazing, wait until you see [the new one]. It's going to knock your socks off," she exclaimed. The new "Ben-Hur," directed by Timur Bekambetov, has been re-written for modern audiences and will feature Jesus talking and interacting directly with the main character, unlike the original which showed shadows of Him. And even though the film is a complete revamp, the strong message of faith and fulfillment will still be delivered as powerfully as it was in the original, according to Downey. The storyline follows the character Judah Ben-Hur, who believes he can find fulfillment by winning a chariot race, but that is not the case. His encounters with Jesus Christ completely turn his life upside down in ways that getting what he wanted never could. "Ultimately [Judah Ben-Hur] brings a hardened heart until the end of the movie where he's angry and has a desire for revenge. And through an encounter with Jesus he ultimately lays this down and it's an extraordinary moment in film," said Downey. Ben-Hur has an opportunity in the film to give Jesus water as he's being taken to be crucified. In that scene a Roman soldier kicks him for the gesture and Ben-Hur picks up a rock to retaliate. Jesus stops him before he can strike the soldier and says, "I give my life of my own free will." Judah Ben-Hur is left in a state of shock after the encounter and he makes the journey to Golgotha to witness the crucifixion first-hand. "He hears Jesus say from the cross 'Father forgive them, they know not what they do,' and he has this moment of transformation where he finally understands that the only way forward is forgiveness. And he has this moment of conversion and he drops to his knees," said Downey while describing the scene. "Ben-Hur" will be released in 2016.